With more than 20 years experience and more than 100 accredited noninvasive cardiovascular diagnostic programs throughout the U.S., NAVIX is the market leader in helping clients achieve cardiovascular service line growth from vascular services. NAVIX partners with academic and community hospitals, ambulatory surgical centers (ASCs), private practices, accountable care organizations (ACOs), access centers, and other healthcare providers to optimize noninvasive vascular and cardiac imaging services delivering high-quality diagnostic services with the best outcomes, clinically and financially. Above all, our deep domain expertise in vascular ultrasound enables NAVIX to provide a unique solution to physicians and administrators seeking to improve the results of their cardiovascular service line. As a result, the NAVIX team has helped hundreds of institutions optimize the quality and use of noninvasive vascular testing resulting in earlier vascular disease diagnosis and better patient care. While NAVIX primarily focuses on improving vascular disease diagnosis, we also provide expert support in other imaging modalities – echocardiography, nuclear medicine, Holter monitoring, general ultrasound, obstetrics, and gynecology ultrasound. Whether you are interested in improving your current vascular diagnostic service or adding a new vascular lab, NAVIX can help! Developing high-performing Noninvasive Vascular Labs (NIVL) is our specialty. NAVIX is not an outsourced provider, rather we are a partner to help you achieve the best outcomes, clinically and financially. NAVIX is focused on developing high-performing vascular labs that enable earlier detection and treatment of vascular disease. More importantly, NAVIX’s clinical and operational management will ensure you get the most out of your service line investment by integrating vascular diagnostic services across all specialties leading to quicker and more effective diagnosis of vascular disease. This unique approach will not only increase revenue from your vascular diagnostics but increase your downstream revenue from interventional procedures. NAVIX’s services cover all vascular testing areas including extracranial cerebrovascular, peripheral arterial, venous, and visceral. If you are interested in Noninvasive Vascular Diagnostic Lab Services, NAVIX offers a complete solution. NAVIX provides the most comprehensive education for physicians interested in learning how to interpret various noninvasive vascular imaging and physiologic tests. We offer our Vascular Ultrasound Interpretation Preceptorship in a variety of formats including a program that supports APCA’s new 100 case pathway. Whether you are seeking to gain more experience in vascular interpretation or obtain your Registered Physician in Vascular Interpretation (RPVI) credential, NAVIX has the program to meet your needs. Just wanted to drop a note regarding the recent NAVIX course done for our physicians. We are a large practice with over 40 physicians. When we wanted to bring in an organization with the experience, expertise, and flexibility to work with the myriad of schedules we had to coordinate, we knew NAVIX was the right choice. They not only worked with us to get the training sessions scheduled on dates and times that would work, they knocked it out of the park with the quality of the program. Several of our physicians have raved about the course and felt the content was invaluable. We highly recommend the NAVIX RPVI Course. This Vascular Ultrasound Preceptorship supports APCA's RPVI 100-case pathway meeting the prerequisites for fellows, residents or practicing physicians. Our faculty covers the same topics taught in our popular 4-day Preceptorship but with fewer cases in 2.5 days. Since 2009, NAVIX has been educating physicians in the interpretation of vascular ultrasound. NAVIX's 4-day, 500 case preceptorship was designed to provide physicians experience reading cases with varied pathology using IAC-compliant diagnostic criteria and report standards. This program is designed specifically for fellowships seeking the foundational skills and vascular interpretation experience with exposure to varied case pathology with preparation for RPVI exam. Our expert faculty cover physics and Proctor up to 500 vascular ultrasound cases. This program is customized to meet the needs of a group physician practice interested in learning vascular interpretation. NAVIX’s expert instructors provide a rich learning experience for physician groups seeking to standardize reporting and improve the quality of the vascular lab. ARE YOU HAVING AN ACCREDITATION EMERGENCY? NAVIX CAN HELP! Need Accreditation Maintenance, Training & Support? 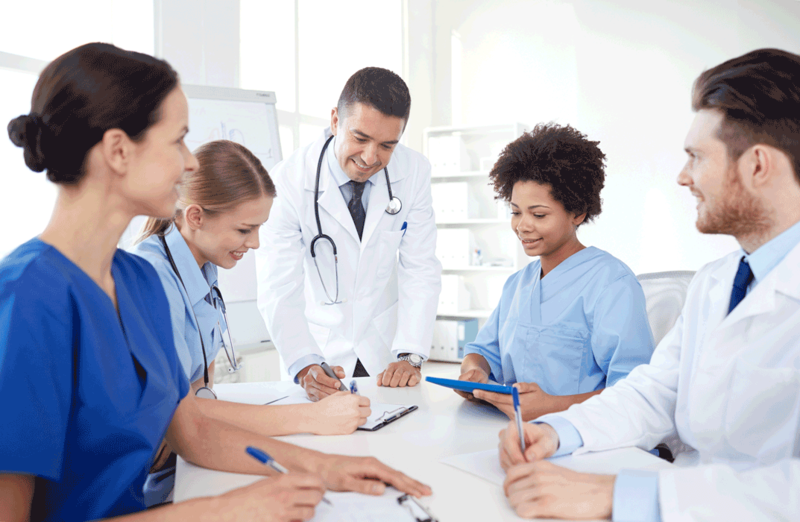 Our accreditation experts provide the complete support your program needs to obtain and maintain your accreditation with the American College of Radiology (ACR) or the Intersocietal Accreditation Commission (IAC). Whether you need help on a specific problem, an IAC audit, or you want ongoing accreditation maintenance, NAVIX can help! We offer training, quality audits, maintenance, and consulting both hourly, or an ongoing monthly or quarterly program. NAVIX will work with you to customize a solution that best suits your needs. NAVIX customizes its services to the needs of our clients. If you are interested in discussing any of our programs, we would be delighted to schedule a meeting or conference call. Over two decades, Navix has delivered programs and training to support the development of world-class vascular diagnostic programs that achieve IAC accreditation and create an alignment of physicians and departments increasing endovascular interventional and vascular surgical volume. Navix works with some of the most prestigious vascular programs in the nation. Navix is a clinically-focused organization with a team of nationally recognized experts in vascular ultrasound. Our deep domain expertise in vascular disease diagnosis has led to our involvement in several clinical trials including Harvest, Euclid, and Ti-Pad. Navix was nationally ranked #3 in recruiting and enrollment for Euclid Trial for Duke and Astra Zeneca. On behalf of our team, I would like to thank the Navix Team for the excellent vascular ultrasound training. Gillian did a great job coordinating the logistics of our training and our instructor, Tish, was outstanding. We learned a lot and feel far better equipped to move forward with our project. We appreciate your working with our knowledge base and helping us learn so many of the finer points of the procedure. NAVIX’s clinical and operational team assists physicians and administrators achieve one standard of care in the delivery of vascular diagnostic services resulting in improved quality, higher efficiency, and better outcomes, clinically and financially. NAVIX’s focused approach to integrating vascular diagnostic services may be exactly what you need to take your cardiovascular service line to the next level. Often times, department structure and specializations compromise a healthcare organization’s ability to identify and treat vascular disease. NAVIX’s innovative approach to vascular diagnostic program integration allows you to identify vascular disease across specialties. If you are developing, expanding or trying to standardize your vascular diagnostic program, NAVIX can help! Our team will develop a customized solution that is practical and cost-effective. We partnered with Navix for Vascular Ultrasound coverage and training. Navix worked side by side with our technologist to be sure they were proficient in all vascular exams. Our technologists are now Registered Vascular technologists thanks to the mentoring from Navix. We continue to work with Navix as they provide support via a virtual technical director who is available for questions, offers support, critiques our exams and supplies continuing education. With Navix’s help, we have been able to offer a service that has never been offered in our community and invest in our employees. NAVIX DIAGNOSTIX, a market leader in turnkey diagnostic imaging services and vascular educational programs, partners with hospitals, access centers and physician practices to deliver high-quality, cost-effective testing services that achieve the best outcomes for patients. With nearly 20 years experience and more than 100 accredited heart and vascular diagnostic centers throughout the United States, NAVIX is dedicated to improving cardiovascular care through a collaborative partnership with their clients. NAVIX’s team, many of whom are nationally recognized leaders in vascular ultrasound, ensures the highest quality in vascular testing and training for physicians and technologists. NAVIX’s Vascular Ultrasound Preceptorship provides the most comprehensive training in the advancement of physicians’ knowledge in the interpretation of vascular ultrasound and preparation for ARDMS’ RPVI credential.